and family and making people smile through her lawn greeting business and Auburn college football. ZEUS ~ William Webb is a native Pensacolian who spent 6 years in the Army as a combat and heavy equipment operator. 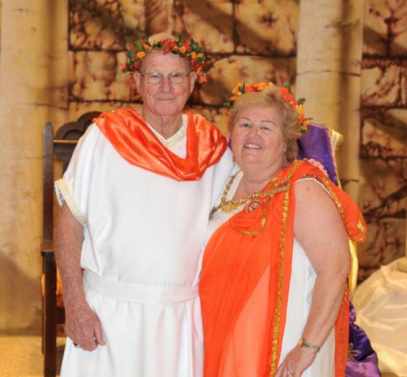 He has been a board member of Camp Dixie for 35 years. His talents include welding and fixing just about anything that family and friends break. His hobbies are fishing, hunting and boating. ATHENA ~ Barbara McLean is a Pensacola native and graduate of Pensacola Junior College. She is a member of Pine Woods Presbyterian Church. 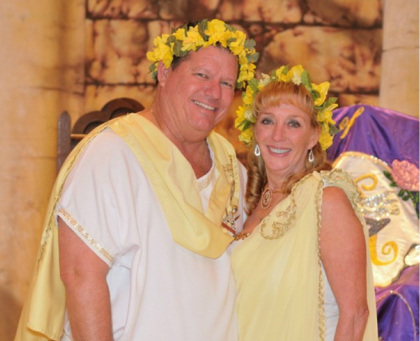 She is a past board member of the Krewe of Aphrodite and Fiesta Frolickers. She is also a member of Les Harlequins. Her hobbies include being a master porcelain doll maker. She has been married to her best friend for 43 years and they have four terrific grandchildren. POSEIDON ~ Mike Andel received a BS from Embry Riddle Aeronautical University. He retired from the Army and retired a second time as an airline captain with Airborne Express. He is now owner of Gulf Coast Led Lighting. 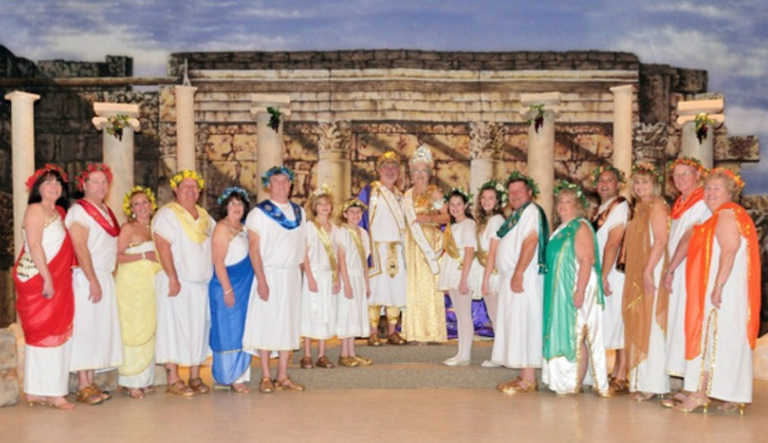 He is a member of the Board of Directors for the Krewe of Lafitte and the Peninsula Association of Gulf Breeze. He enjoys boating and designing stained glass windows. DEMETER ~ Susan Williams is a South Carolina native. She attended Pensacola State College on a basketball scholarship and graduated with a nursing degree. She went on to the University of West Florida with a softball scholarship and graduated with a master’s degree in sports science. She has been employed by the Santa Rosa school board for 29 years and is presently the Dean of Students at Pace High School. She and her husband have coached the Pace High Softball team for 20 years. 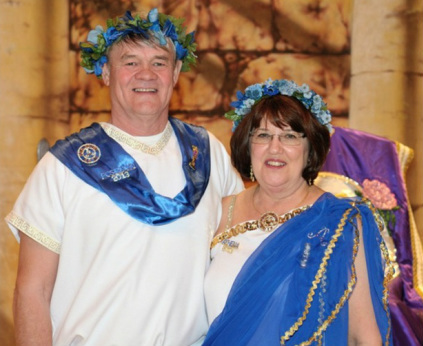 She is a past board member of the Krewe of Aphrodite, Les Harlequins and Pilot Club. She is a past president of the Maids of Luna and Alpha Delta Kappa. She is married to the love of her life for 31 years, Curtis, and they have four grandchildren. 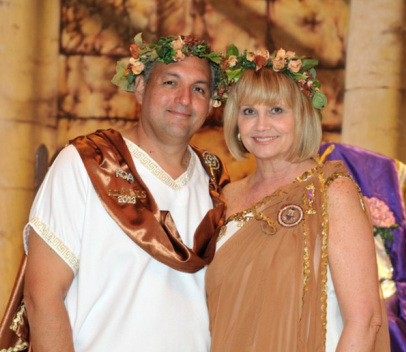 DIONYSUS ~ Jon Hernandez was born in Pensacola and he and his wife returned to the area after living eleven years in North Carolina. He is the Senior Systems Integrator with Computer Science Corporation. He is a four year member of the Krewe of Lafitte and is currently serving as Float Czar. 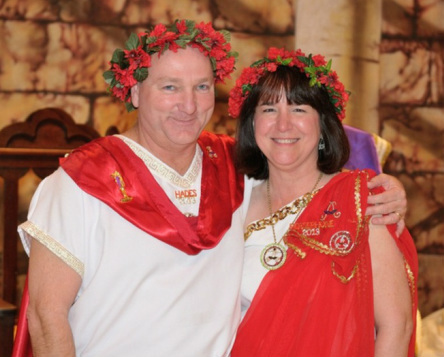 He is a past board member of the Krewe of Seville and served as Prince on their Court. He enjoys collecting and tasting beers from around the world. He likes to excel at being a bad influence on others and cheering for his beloved Florida State Seminoles. ARTEMIS ~ Pat Worsnop was born in New York City to first generation Americans of Irish parents. She graduated from Kaupert School of Business in Queens, N.Y. She is a retired US postal service worker and now owns “Monograms Etc.” She is a member of St. Ann’s Catholic Church, the Pensacola Quilt Guild, the Santa Rosa Woman’s Club and the Bodacious Bells. She enjoys reading and crafting and spending time with her 11 grandchildren and 1 great granddaughter. She lives six months of the year in Donegal, Ireland. HERMES ~ Bill Taylor graduated from Tate High School. He served in the Army during the Korean War. Following the Army, we worked for Monsanto and retired after 38 years. He played a major role in getting the Bellview Dixie Youth Baseball and Football programs established. He is a charter member of the Bellview Volunteer Fire Department. He is a member of the Krewe of Laffitte, and Karnival Kavaliers and the Loyal Order of Moose. In his retirement years, he calls square dancing, fishing and playing music with the Stumpfiddle Band. He was been married for 60 years and has 4 grandchildren and 3 great-grandchildren. PERSEPHONE ~ Rhonda Pippin was born in Birmingham, Alabama. 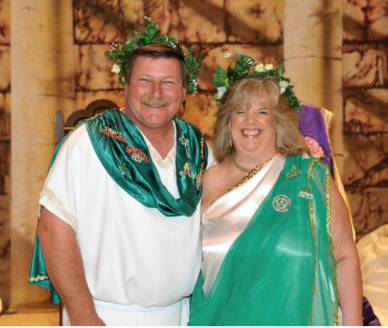 She is a past Treasurer, VP and President of the Krewe of Aphrodite. She is a past Court Member of Fiesta Frolickers and Les Harlequins. She is a member of Maids of Luna. She has been involved with Fiesta Forces since 1994. She attends First United Methodist Church. Her hobbies include reading, baking, being with friends and cheering for the Auburn Tigers, no matter how bad a season they have! She is married to Mitch and together they have 3 children and 5 handsome grandsons, especially the youngest- Gabe! HADES ~ Jeff Cosby was born in Columbus, Georgia. He graduated from Pensacola Junior College, the American Institute of Banking and attended Auburn University. He is a member of the Pensacola Beach Elks, Krewe of Lafitte and Fiesta Forces and Par Four Charities. He was a Commando with Fiesta of Five Flags from 2003-2005. He was in the Court of Krewe of Lafitte and Aide De Camp for Lafitte in 2010. He was the American Knight in Fiesta of Five Flags DeLuna 2007 Court. His hobbies include boating, fishing, golf and Auburn football. ALETHEA ~ Megan Maiberger was born in Pensacola to George and Laura Maiberger. Her grandparents are Barbara and John Gaffney. 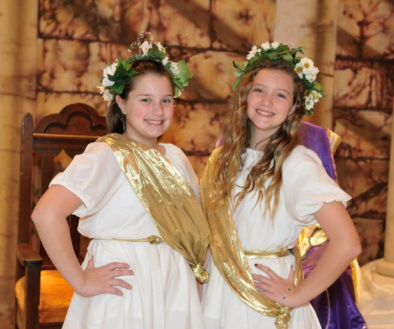 Megan is a member of the Pensacola Children's Chorus. She loves singing and dancing. Megan plays the violin and is a member of her school's orchestra. She is also a member of the Student Government Association at her school. In her spare time, Megan enjoys playing with her friends, swimming, drawing, and playing with her puppy, Tater. IRIS ~ Addison Cronk is the daughter of Mr. And Mrs. Patrick Fairhurst and the granddaughter of Dr. and Mrs. Kermit Adkins. She is a straight “A” student at Brown Barge Middle School. She has won several art competitions including three “Bright Images Visual Art” awards. She has had four poems published in the Young America Poetry Digest. She has also been in two public service commercials. For hobbies, she enjoys tennis, running and painting. 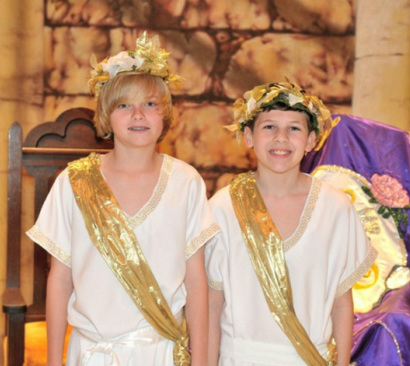 TRITON ~ Brantley Culbertson attended N. B. Cook Elementary School, where he was an honor student. He is currently a sixth grader at Ransom Middle School where he is on the honor roll. He is a baseball player, as shortstop and pitcher, playing on both travel and all star teams. He was on the Krewe of Lafitte 2010 Children’s Court. At only ten years old, he became a certified diver. He loves to dive for lobster in the Florida keys. He also enjoys hunting and fishing. He dreams of catching a bigger fish than his Bampaw Culbertson. Triton is the son of Melissa and Damon Culbertson and the grandson of Esther and Warren Culbertson. son of Tracy and Stacy Spence and the grandson of Arnold and Carol Rosenbleeth.